I hear the clamor—you want an update on Polo and Clover, don’t you? Currently, Polo is lying on a pillow next to me while I write. That’s where she often is. Clover is lying on top of the picnic table, next to my pot of oolong. I can only hope the squirrels stay away so she doesn’t leap and loose my tea from its cozy home. The other night we were at an outdoor dinner party at a friend’s ranch, and her dog, Chevy, wandered around the guests, making herself at home. I’ve met Chevy before. She’s a white Lab, 11 years old. But even though she’s about 100 pounds bigger than Clover, the two of them do the same thing—if you pet them, they flop over onto their backs and put all four paws in the air and let you rub their bellies. I spent some quality time with Chevy after most of the guests had left. I sat in the grass with her, rubbing that belly. I considered lying down next to her, but everyone would have talked about John’s weird wife. You know, that poet lady. I try to behave myself in public, but it can be difficult when a sweet dog wanders by. Years ago, before my parents turned the screened porch into a second living room, my aunt and uncle came down from Wyoming with their dog, which back then was a white husky. My uncle didn’t want the dog to be lonely, so he slept out on the porch with him. At the time, I thought he was crazy. Now, I wish I would’ve dragged my sleeping bag out there with him. Someone’s got to sweep it. Why not at 10:34 a.m. on a Thursday. like I’ve never swept my own home. to locate the dust pan with snap-on brush. I stay. Stare at the debris, so easy to collect, to toss out. Last week I said I hadn’t read any friends’ books lately, but I did read Michelle DeRusha’s “50 Women Every Christian Should Know: Learning from Heroines of the Faith.” I finished it before my vacation, and then we had a family funeral, so I never sat down to process it. As I went back through my Kindle notes, here are some of the quotes I highlighted. These quotes spoke to me personally, but in choosing to highlight these women, I left out others I already loved — Teresa of Ávila, Thèrése of Lisieux, Corrie ten Boom, Mother Teresa, Madeleine L’Engle (my writing hero). Some of these sainted women from other centuries I’d heard of through the writings of Richard Foster. I’ve read about others on my own. But Michelle introduced me to women like Phyllis Wheatley, Pandita Ramabai, Mary McLeod Bethune, and Faye Edgerton. These women are our heritage. Thank you, Michelle, for writing something of substance, something beyond the Christian fads. If these women all gathered for tea, they would disagree on many particulars, just not the most important thing. it has thanked us, filled our grass with nuts. Those of you spread across the country, doing your part to fill online spaces with good words, I have neglected you, and I am sorry. I have missed you all. I almost wish I could claim some awful tragedy over the past four months prevented me from visiting your blogs and reading your guest posts. But no. I was just busy finishing my own book. My manuscript is now being edited, and I can finally think beyond my own words. Those of you who released books during these months, I haven’t read them. I haven’t even seen the hype. I know I’ve missed so much great stuff. I swore I wouldn’t be this person, the person too busy for anyone but herself. But I was. Of course, I did, you know, still do my job and move two kids to school and take a much-needed vacation with my husband. Polo and Clover still got walked. I’ve traveled over 1,200 miles in the last two weeks … all in Texas. The one place I won’t be traveling this fall is to The High Calling retreat at Laity Lodge. That weekend already is full. But I will read your words. Okay, so it’s not exactly a waltz across Texas. It’s a drive. A long drive. 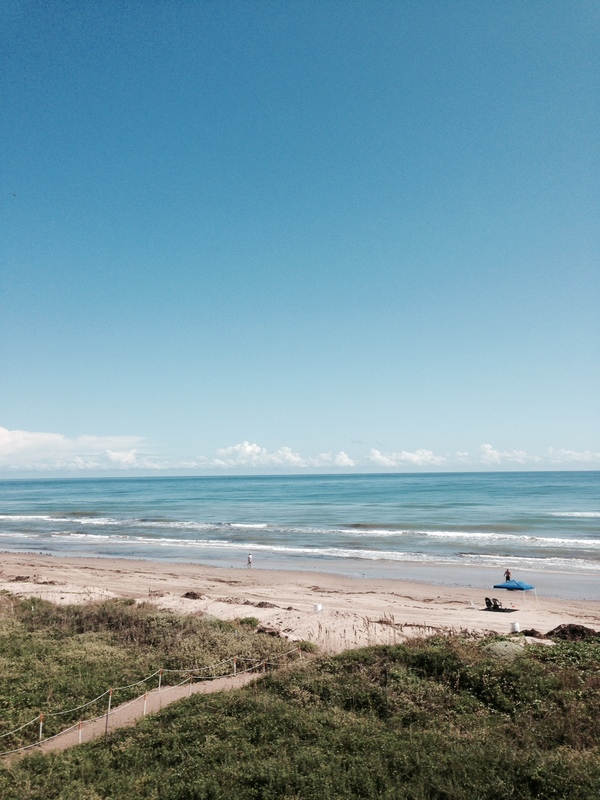 Last week we went to South Padre, at the tip of Texas. This week we’re in Amarillo, at almost the top of Texas. Padre was for vacation. Amarillo is for a funeral for someone gone too soon. The day after I return, I’ll drive to San Antonio, and the day after that, to Waco. Such is the life of a Texan. When you drive the middle section of the state, the only hills are where I currently live. Lots of flat land on either end of the state. The mountains are out west. The pine trees are in the east. No autumn color yet. The only thing to see is the sky. I’m used to driving. I like it. When I have the wheel, I don’t like to relinquish it (just ask my husband). But this trip I hitch a ride with other family members. We travel interstates and U.S. highways and state highways. Maybe even a farm-to-market road or two. Our family converges not only from all parts of Texas but also New Mexico and Oklahoma. The Californians are now Austinites. We drop everything and come because that’s what family does. We spend money intended for something else, and we don’t think twice. We give each other space to grieve loudly or quietly or to run necessary errands or to be busy in the kitchen. But we do not understand. Not at all. 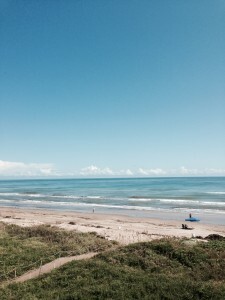 At the end of my month off blogging, my husband and I took a trip to South Padre Island. I did bring my computer, but I didn’t use it except for one work email. I brought my poetry journal but didn’t even open it. Mostly I watched birds and waves and collected shells—177 of them. When I was a child and our family went to the beach, I collected shells, but I don’t remember finding them in this many colors. Forty-two are autumn shells: yellows and browns and even a little orange. Another 16 looked black when I picked them up, but they’ve dried to gray. Two dozen are striped blues. Thirty-one are more traditional white and variations of white. All the shells I just described are what’s known as Atlantic Cockles, although I also have several broken abalones. “What are you going to do with those?” my husband asked. I still don’t know. It just seemed important to save them. It was our first trip alone in two-and-a-half years, our first time to go to the coast by ourselves. I can’t save the sound of the waves or the smell of the salt, but I can save these shells. Unfortunately, I do not own a glue gun or any crafting materials that could be used to make the shells cute. I really don’t do cute. I can write a poem about things, but I don’t know what to do with actual things I can hold in my hands. Maybe no one else would find my shells as spectacular as I do. If they were in a museum, the exhibit would be labeled “Common Texas Gulf Coast Shells.” But I found each one. I got more sun while bent over the sand, picking up shells, than I did in the water. I can remember finding the speckled one, the one with three hues of gray, the one that looks like a latte—complete with a milky swirl. They’re mine. I’ll figure out something.